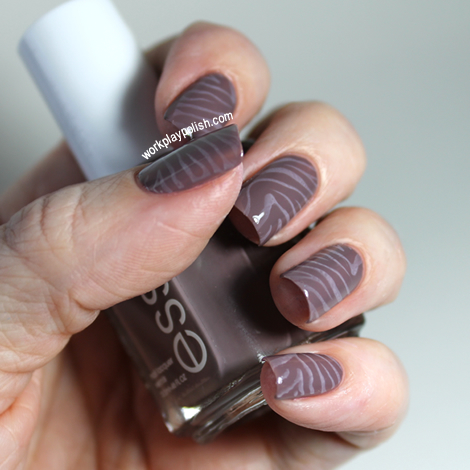 I was going to call Essie's Merino Cool a gray/beige/purple creme that's office-friendly. But what do I know? 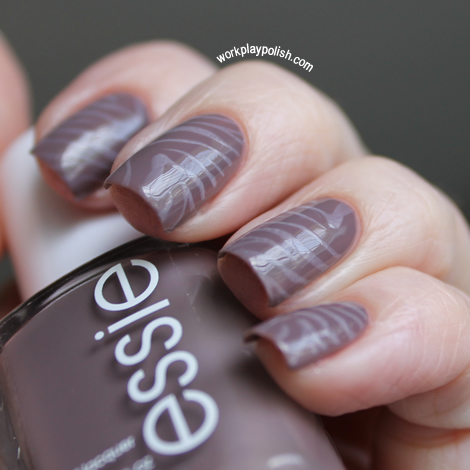 Essie describes it as a "sensuous autumn mulberry." In March 2011, the Upper West Side blog declared it "the most popular color on the Upper West Side." And apparently Lady Gaga wore it to the VMAs the night she wore the meat dress! So I learned something today. I learned this color is a lot hipper than I gave it credit for...however, I did add something exotic to this mani - so hopefully I'm not too out of touch. I polished two coats of Merino Cool. Then stamped the zebra print with Konad plate M57 and OPI Second Honeymoon, a soft pink. I like the subtle effect. I would even wear this to work if I wasn't seeing a client. Sans zebra print, Merino Cool would be a great work polish any day. So pretty.